On the 12 October, Miriam ran an event funded by The Physiological Society to promote Physiology Friday at The University of Leeds. The aim of this outreach event was to raise awareness of how technological advancements in microscopy are improving our understanding of how human physiology can change within health and disease at the cellular level, specifically related to the heart. Within research, the knowledge of our own physiology in health and disease has developed in part from the advancement in microscopy, which has enabled the visualisation of single proteins. This advancement can be likened to the difference between an individual who is legally blind compared to someone who has 20/20 vision. Our event utilised visual impairment glasses which distorted an individual’s vision. Participants were asked how well they could resolve the outline of a structure in the absence and presence of the glasses to convey the significance of the development which has occurred within microscopy. Supplementary posters led individuals through the physiological relevance of this technological advancement, with images detailing the single protein structure within the heart. With the use of an anatomical heart model, the function and structure of the heart within health and disease was explained. 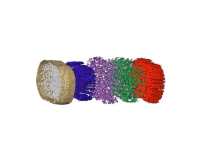 We communicated how current research is using a super-resolution version of microscopy to characterise how a change in function during heart failure can be due in part to a change in the protein structure within a heart cell. To help convey the scale at which the cellular remodelling within heart failure is occurring, real-life examples were used. For example, if a person was tall enough to reach a plane flying at 30,000 feet then the proteins that we are imaging would still be smaller than the width of that person’s hair. Smartphone microscopes were available to allow individuals to experience first-hand the ability that a microscope has to study an object at a more detailed scale compared to what can be seen by the human eye alone. Over the course of the day a dialogue was created with students from all disciplines. This sparked a variety of questions on the topic of physiology; what is a heart attack? What happens to the proteins within your heart during heart failure? The event even led to one student exclaiming that “microscopes are so cool”, with another stating “I learned how much I need to take care of my body”. Many thanks to The Physiological Society who funded and supported this event – now to start planning the next one! In June 2018 Miriam attended a Public Engagement Training Day which was run by The Physiological Society. Building upon the skills learnt at this event Miriam gained funding from the Society to organise and run an event at The University of Leeds to promote Physiology Friday. Her reflections upon this training day can be read on Page 47 in the Winter 2018 Issue of Physiology News which can be accessed here. Miriam recently entered the ‘Three Minute Thesis’ competition held at The University of Leeds. A video of the presentation has since been uploaded to the conference YouTube channel which you can access here. A particular highlight of this competition for Miriam was hearing fellow researchers from a variety of disciplines communicate the wide-ranging impact of their research. The other presentations on the channel are a wonderful demonstration of this.